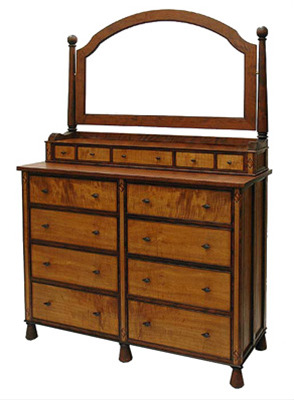 This double dresser was designed as a companion piece to a king size bed and side tables. It's made from curly cherry and curly maple with walnut details and burl inlays. The mirror on top tilts, and, all in all, it is one of our more stately and functional bureau designs. 54" x 78" x 20"